On the road the adventure never stops. The plan was to find a hostel, some wi-fi and shower…yes in that order. You guys back home probably don’t realize the full extent to which our lives have been linked to internet. Although it is absolutely awesome to disconnect from the world for a few days, after a few days you start to realize that you are missing your friends, parents and want to check up on them. Just as we planned we found a hostel, decent wi-fi and a shower. But instead of relaxing for a few days and writing the blog life had other plans. 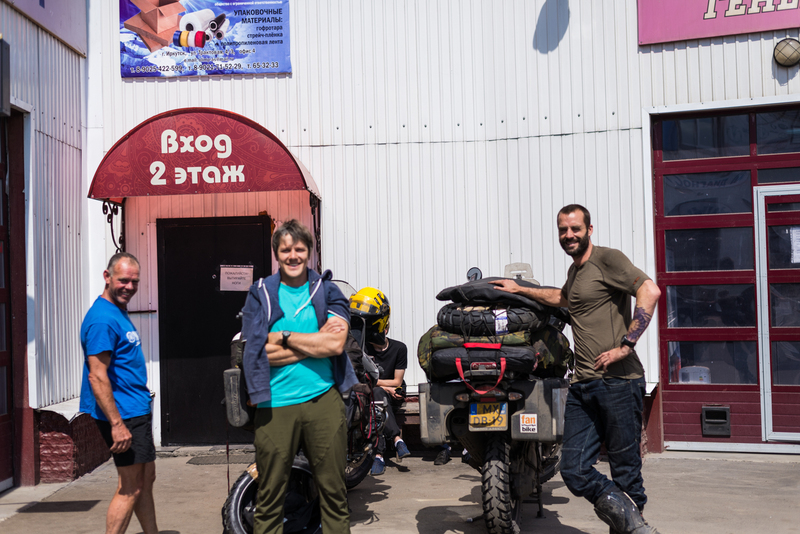 In the hostel we met a couple of Dutch guys who were driving to Magadan, the final point in Russia of the “Long Way Round” crew. 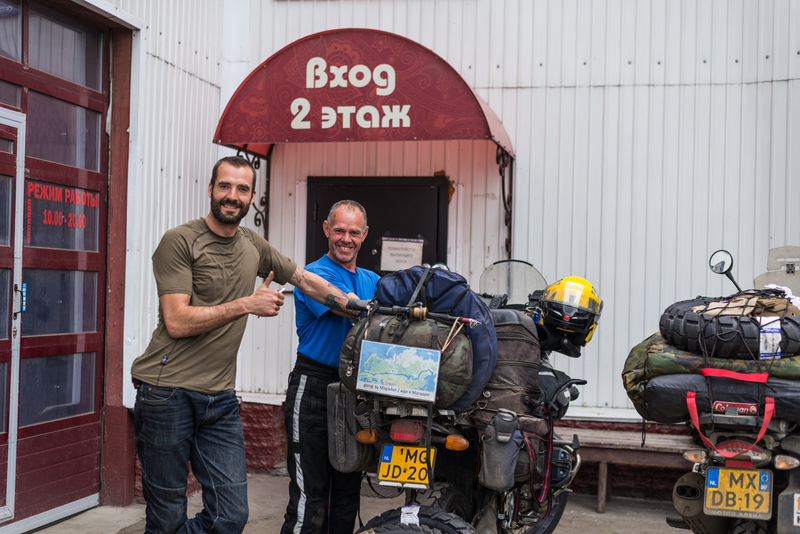 Auke (right) and Jos (left) are supposed to be the first Dutch motorcyclists to have completed this arduous journey. Unfortunately, somewhere along the way Jos’s starter motor broke, it seems that “someone” dropped the starter and all the magnets broke loose. If you watched the “Long Way Round” series, then you remember that there is a part of the road that goes on the train tracks and can be extremely dangerous if you are on the tracks when the train is approaching and you CAN’T start your engine. We personally have received so much help along the way from random people, that i couldn’t just leave these guys without helping. I know they would have been 100% okay, but i wanted to help out. So once again we call upon the great Russian network of motorcycle clubs…aka Dzhargal from Chita and ask if he knows anyone in Irkutsk. He said no problem and gave me a phone number of the local club president. Quick phone call and we have the coordinates of a place that fixes broken starter motors…knowing people is half the battle. In the morning we all went over and patiently waited while the mechanic meticulously took it apart and glued all the broken magnets back on. Voila…3 hours later, the starter back on the bike, the battery connected up. Here is the moment of truth…Jos pushes the button and the magic sound of metal screeching emerges. This would be a terrible sound any other time…but now its absolute magic to the ear. The magnets are scratching, but the bike starts. Now you are thinking to yourself, why not just get a new starter motor? Well, that sounds like a good idea…if you are in a country with a developed distribution network…but in Russia it would take a month (no joke) to get a motor to Irkutsk. We wished good luck to Auke and Jos on their trip…be safe and all that stuff, and we headed somewhere quite…finally to write. 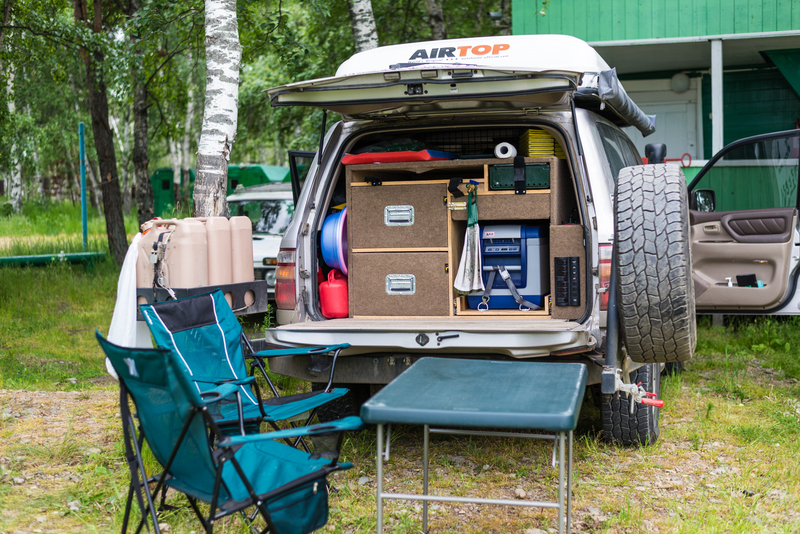 Around Baikal there are a bunch of “Tur baza” (hotels/campgrounds) where we posted up for a day for 100 rubles a night. That place would have been perfect…if it had wi-fi. By this point you might be confused at our general direction of travel. 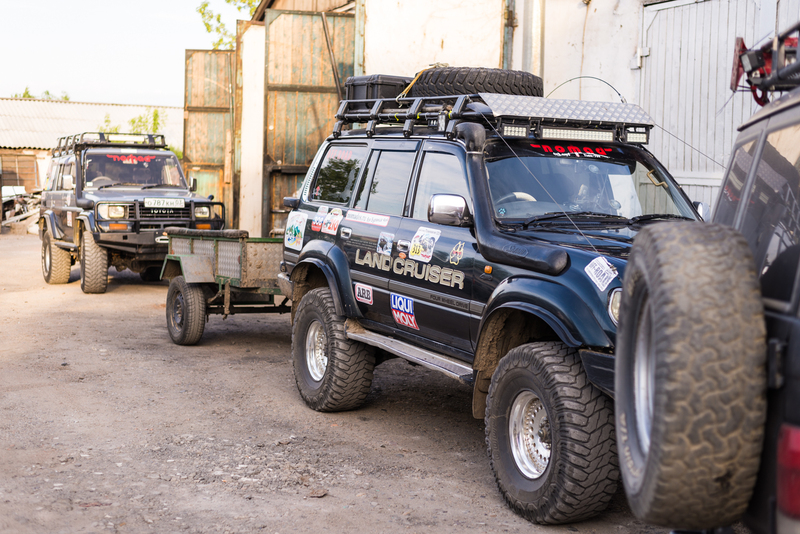 The plan is to go back down from Baikal to Ulan-Ude and then onto MONGOLIA, one of the reasons we even dreamed of doing this adventure! 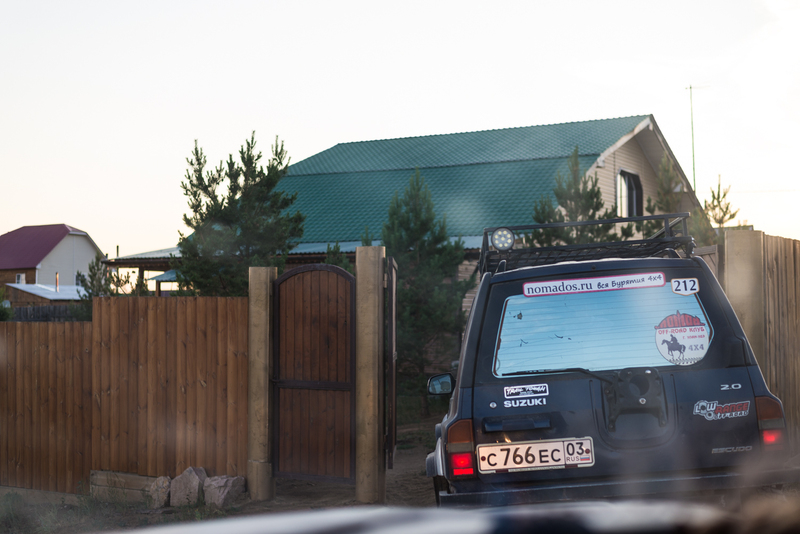 The first time we went through Ulan-Ude we randomly saw a kitted out Land Cruiser while filling up at a gas station. Whats more interesting is that it has a “Nomad” sticker on it…wait we are also Nomads. On the way back we decided to find the website of the “Nomad” club and post if anyone is willing to meet up with us and maybe give us a place to park for the night…hopefully. 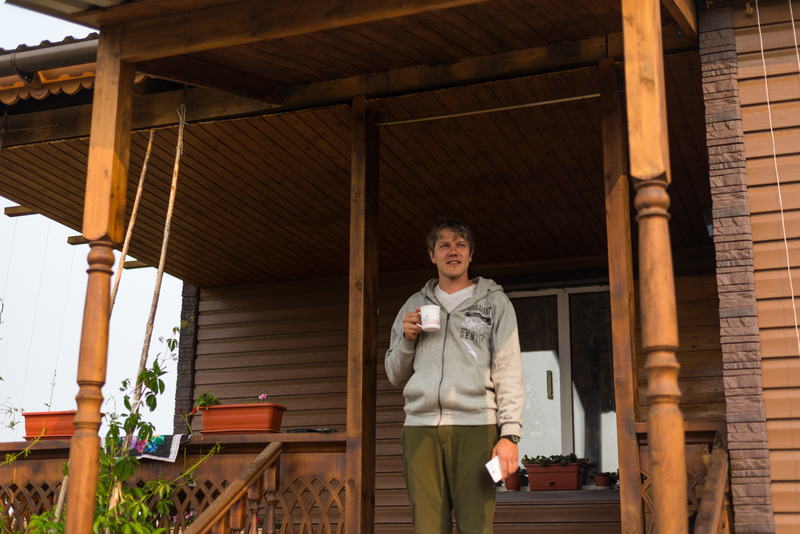 Within minutes one of the members of the club, Peter (Petya, in Russian), messaged us saying that we are more than welcome to come to his house for dinner and rest! 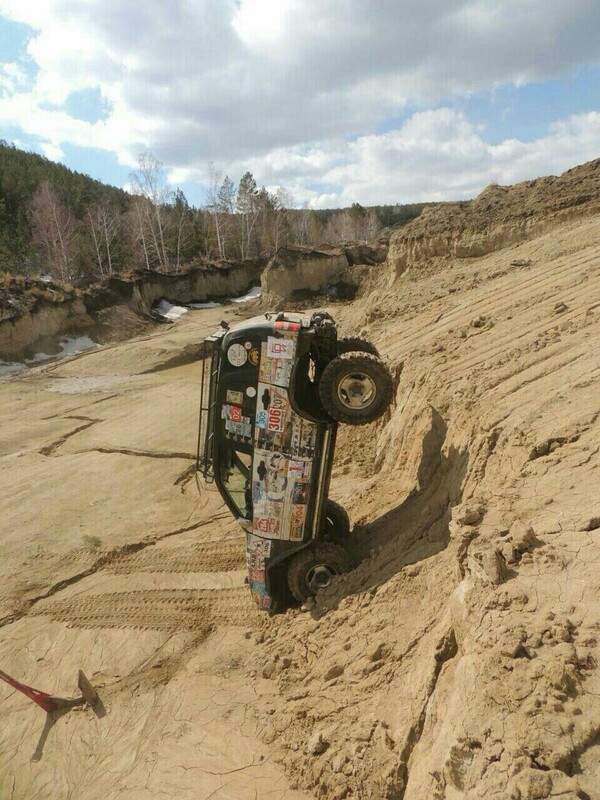 The Nomad Offroad club is not a joke, these guys are serious about the word “offroad”. 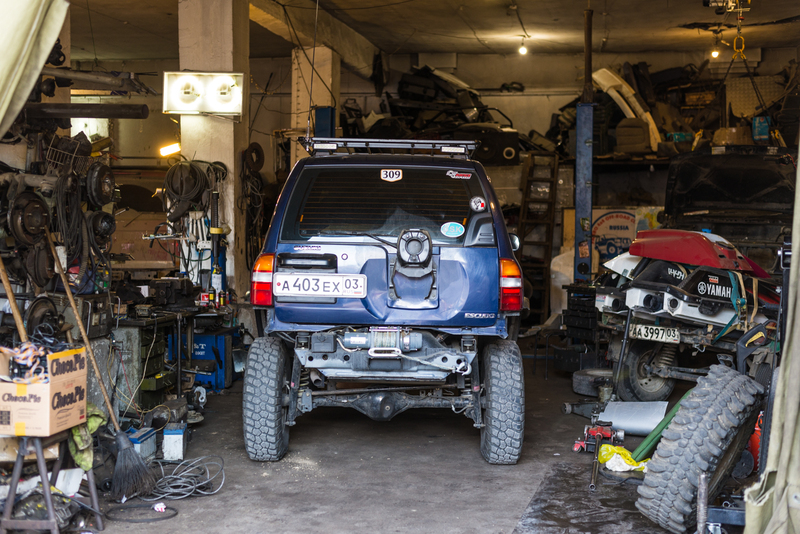 Petya invited us to meet at the club’s headquarters – a two bay garage filled to the brim with tires, axles, bumpers, winches and half-finished cars. These guys idea of fun is to find a place with no road, a bunch of mud, water, sand then pick a direction and just go, whatever that entails…climbing up hills, swimming through rivers…getting stuck in swamps. Our Hodori looks like a pleasure cruiser compared to the “Nomad Club” cars. I’ll say it’s because we have a different purpose, we overland for a long distances over mild terrain and they visit places in cars that never meant to have 4 wheels there. If you think that this is a terrible picture and the owner was freaking out when it happened…then you are right. He was freaking out because no one was taking any pictures and the car might upright itself any moment. No…this is the normal operating position for vehicles built by Nomads, they are not afraid to be on any of the 6 possible sides of the vehicle…thats just he way they like it. After we respectively oogled at each other’s creations Petya got in his car and told us to follow him to his house. He apologized for a long drive… a whole 20 minutes out of the city. No Petya…we drove for 8 months so far and I don’t think we can handle another 20 minutes…get us home NOW! 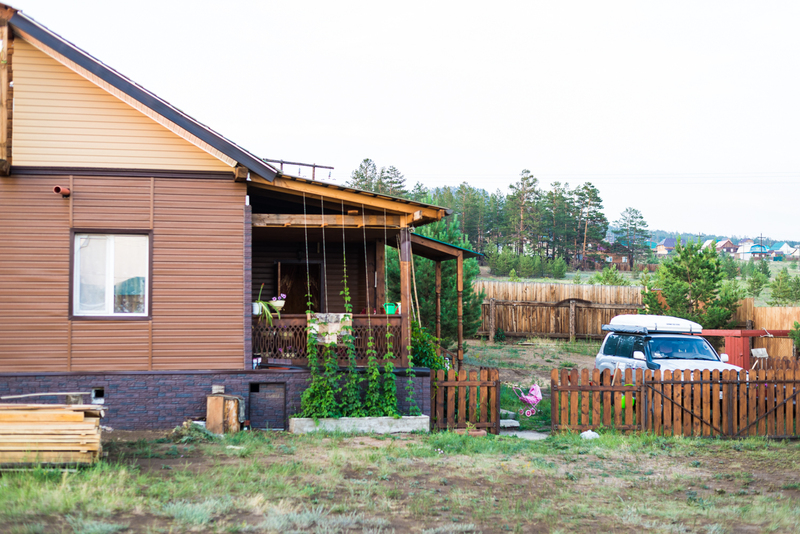 We thought it would be a nice little apartment…turned out to be an amazing house with a huge yard. 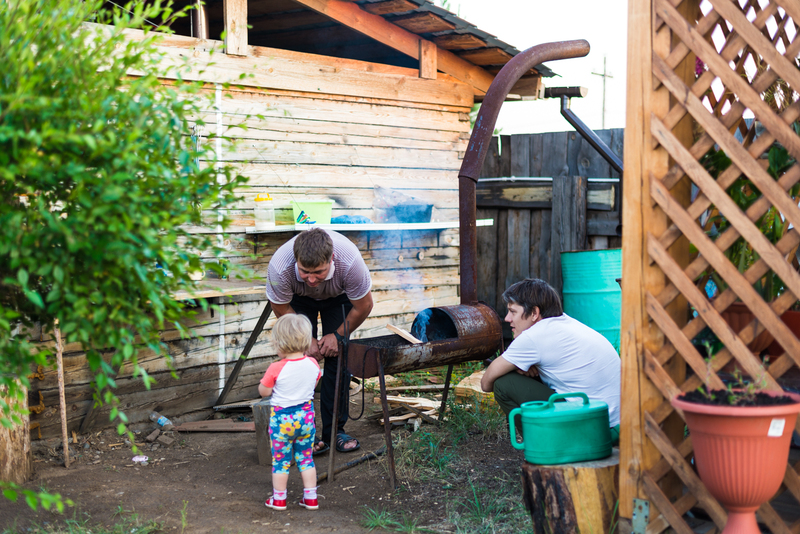 Petya built the house by himself and lives their with his wife, Nastya, and daughter Varya. 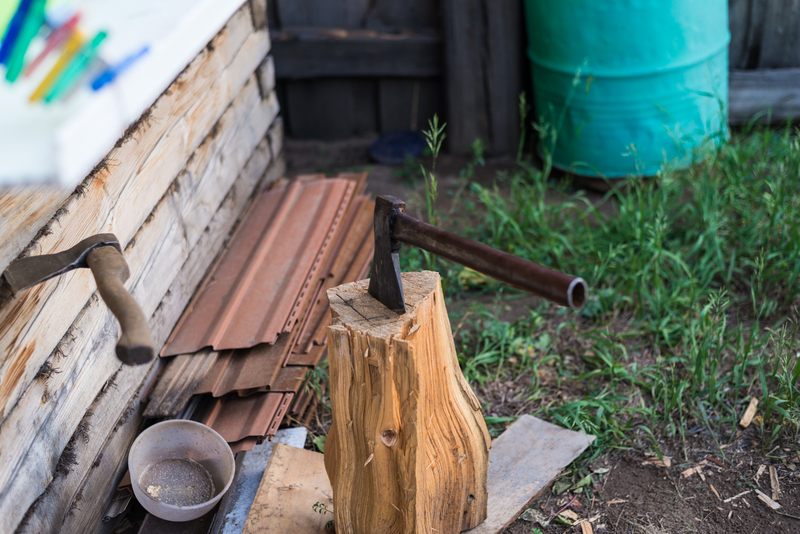 While we were busy getting the dinner ready and by that i mean, I was busy running my mouth as usual, and everyone around actually did something useful, Petya started chopping some wood and getting the “banya” ready. Right, so this is the one out of three russian words that you guys know: “banya”, “babushka” and “vodka”. So, “banya” is like a sauna…except it has higher humidity, making it more difficult to deal with higher temperatures. And they use a little birch branch swatter to hit you with. Even though I’m Russian, i have only been to banya a few times in my life and never with the birch swatter. Unlike what you see in the movies you don’t actually take out your aggression on your friends with the swatter, you are supposed to gently waft the hot air to the skin. More like a fan that ends up gently touching a bristling against your skin. Petya, Varya and I…making the fire for the campfire tea, it taste so much better with a bit of smoke. For dinner a few of Petya club members and friends showed up. 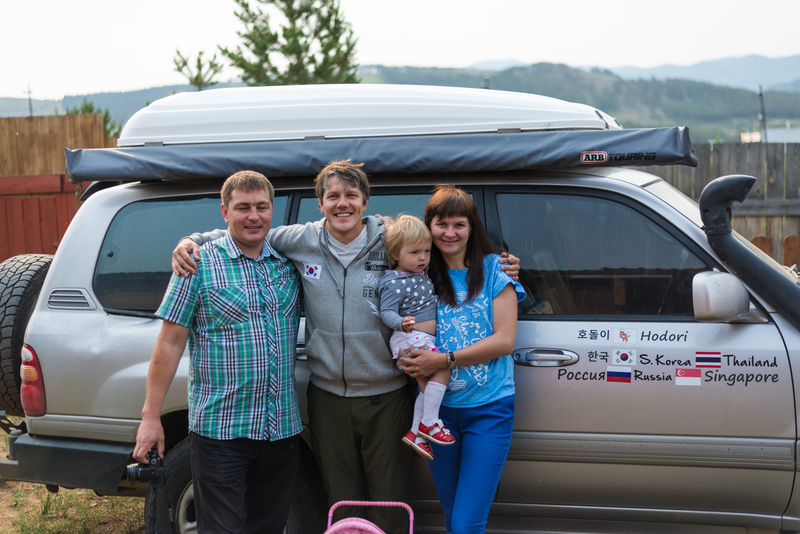 That’s Dennis, whose car we saw the first time we visited Ulan-Ude. Once the dinner was almost ready Oleg showed up. He is another friend and neighbor of Petya’s. Over dinner the guys shared the stories of offroading adventures, accidents, competitions, victories and tragic losses. Trust me, we are completely sober in this picture…even though my eyes are closed. Hyein took a few photos and this is the only one where everyone else looked really good. And since this is my blog and you have seen my ugly mug before…i’ll sacrifice my pride and go with the unflattering photo. After dinner, with the banya which rhymes very well with my Russian name Vanya ready, we took turns to get properly clean. First it was the ladies turn, as Nastya took Hyein and showed her the proper way to beat each other with the swatter. After a while Hyein and Nastya came out of the banya into the cold of the night with barely any clothes and proclaimed that its hot even outside and that they are sleepy. Somehow Hyein managed to make it to the bed and passed out like a little baby. In our turn we spent a good amount of time, sweating it out in the banya then coming out to cool off with a beer and brisk evening air. The body and mind relaxed like we haven’t in many months. We, Petya and I are the same age, but grew up to be “adults” in different environments. It was such a pleasure to see people doing the things they love, whatever it is – sports, dancing, drawing, dieting, offroading and enjoying their lives. Living productive lives, with dreams for the future. 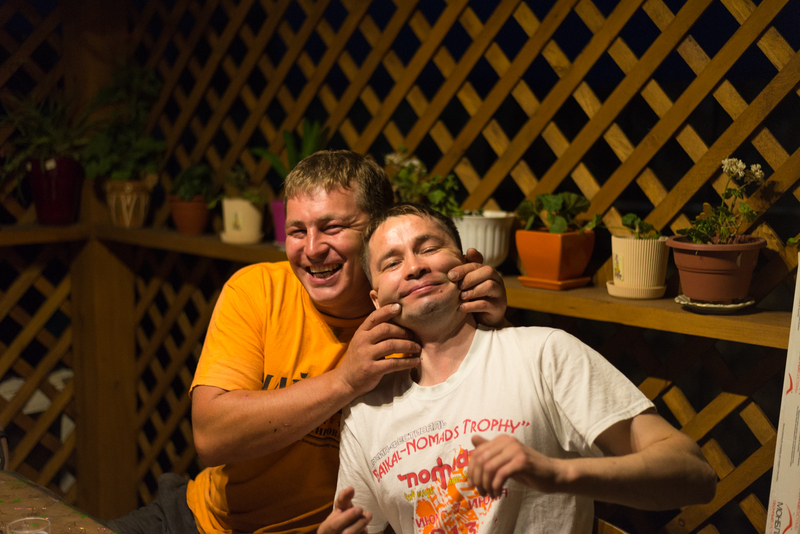 Even though he had work in the morning, we stay up late and enjoyed the banya. All i remember is taking a shower, walking to the bed and then not falling…just disconnecting from the world as the body pulsated with warmth and pleasant tiredness. Banya is truly an amazing thing. In the morning, even though we didn’t sleep too much I felt refreshed and extremely clean. We had a family breakfast while everyone got ready for work and we mentally got ready for going to Mongolia. A quick good-bye as by this point everyone was already extremely late for work. 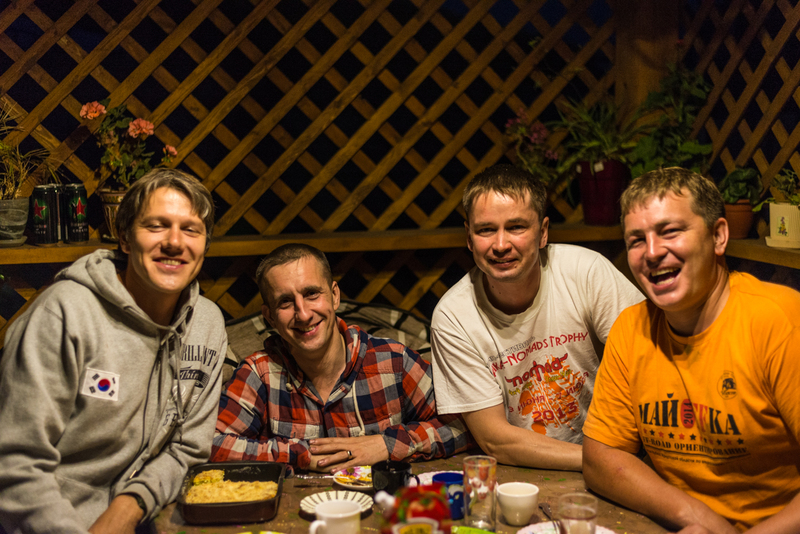 Thanks to Petya, Nasty and Varya…we just asked for a place to park our car and instead got an amazing welcome with a great dinner, company and awesome banya. And we are off to Mongolia.